One of the most popular starches, rice can be transformed from plain to extraordinary in a variety of ways. Martha shows you how to make a fabulous Paella that’s brimming with tender chicken, pork, seafood and vegetables. Next she demonstrates one of her favorites: Stuffed Peppers with fluffy rice, pine nuts, raisins and herbs cooked on a bed of tomatoes. Then Martha makes Persian Rice — fragrant Basmati cooked on top of thinly sliced, buttery potatoes. Martha Stewart shows how to make Horchata by using rice, almonds, cinnamon, sugar, salt, and water. Serve paella for a feast featuring chicken, pork, and seafood in this hearty version of the classic dish. Place chicken in a large bowl and add 2 tablespoons olive oil. Sprinkle with paprika; turn chicken to coat. Cover and let marinate, refrigerated, at least 4 hours and up to overnight. Bring a large pot of water to a boil; meanwhile prepare an ice-water bath. With a paring knife, core tomatoes and score an X on the bottoms. Working in batches, carefully lower them into boiling water; when skins begin to split, after 30 to 60 seconds, use a slotted spoon to transfer tomatoes to ice-water bath. When tomatoes are cool, remove skins (using a paring knife, if necessary) and discard. Halve tomatoes. Remove seeds with a spoon, and discard. Finely chop tomatoes. Using a mortar and pestle, grind together saffron and 1 ½ teaspoons salt. Add saffron mixture to a medium bowl and add 1 cup chicken stock and cognac. Whisk until well combined, set aside. Heat an 18-inch paella pan with at least 2-inch sides over two burners set at medium-high heat. Coat the bottom of the pan with remaining tablespoon olive oil. Season chicken thighs with salt and pepper and add to pan. Cook, turning, until golden brown on all sides, about 8 minutes. Season pork and add to pan. Cook, turning, until browned, about 6 minutes more. Add peppers, onions, garlic, and tomatoes. Cook, stirring, about 8 minutes. Add calamari and shrimp and cook, stirring, about 2 minutes more. Add rice to pan and stir to coat. Add reserved saffron mixture and let cook about 1 minute. Add 1 ½ cups more stock and bring to a boil. Cook, rotating pan and stirring occasionally, 15 minutes. If rice appears dry around edges add more stock as necessary. Nestle clams, mussels, and peas into rice and add 1 cup stock. Cook, stirring occasionally, adding more stock as necessary (you may not need to use all the stock), until rice is tender, shellfish has opened, and nearly all the liquid has evaporated from the pan, about 20 minutes. Turn heat to high. Add haricot vert, and stir to combine. Cook, without stirring, until vegetables are warmed through, and remaining liquid has evaporated, about 5 minutes. Season with salt. Sprinkle with parsley, and serve immediately with lemon wedges. 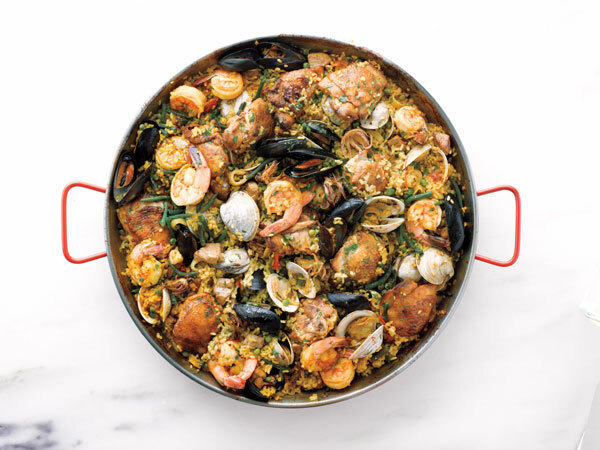 This paella recipe appears in the "Rice" episode of "Martha Stewart's Cooking School."